Half of our stone oven pizza topped with tomato sauce and mozzarella. Choice of two toppings. Blacken Chicken Caesar wrap, served with a cup of soup. Tuna Salad- Egg Salad- Chicken Salad served with coleslaw on a bed of mixed greens. White fish filet sautéed with capers in a lemon butter sauce. Served over angel hair pasta. Tilapia filet sautéed with red peppers, mushrooms and artichokes in a garlic white wine sauce served over linguini. Our pizza dough stuffed with ricotta & mozzarella cheese, and your choice of 2 toppings. Served with marinara. Basil pesto, roasted red peppers, artichokes, fresh tomatoes, red onions and spinach . Scallops and Shrimp sautéed with cherry Tomato, arugula in a garlic white wine sauce then tossed with Asiago stuffed gnocchi. 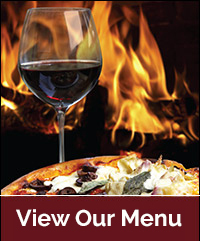 Choose any two entrees from our dinner menu $13.00 and under. Includes your choice of soup or salad AND our delicioso chef dessert. 10 oz. New York Strip, served with mashed potatoes, green beans ans Au Jus. Shrimp, scallops and Maine Lobster tail sauteed with olive oil, fresh garlic, basil and diced tomatoes over linguini. In your choice of a garlic white wine or marinara sauce. (1) 10 inch Three topping Build your own or any Gourmet Pizza & (6) Buffalo wings with celery and blue cheese dressing. All Gourmet & Build your own at menu price, toppings additional. Equal or lesser value free.